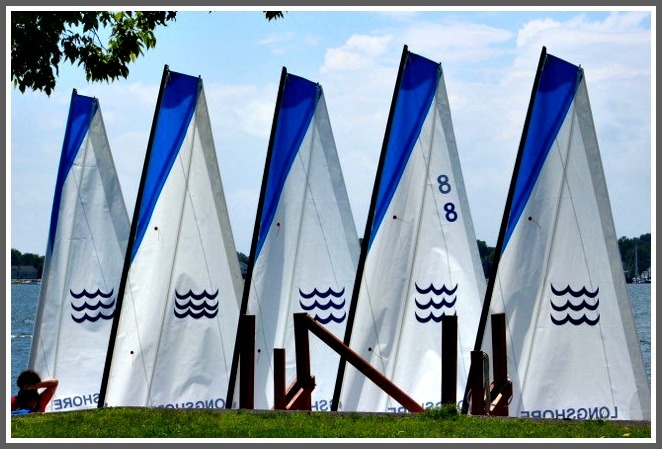 This entry was posted in Longshore, Pic of the Day and tagged Longshore Sailing School. Bookmark the permalink. Curious that only one boat has a sail number. I know that someone has an answer! Our sails unfortunately came without the numbers. We had to start the season with an incomplete set. The good news is that we finally have a complete set of numbered sails for all fleets. Love the crisp new sails! We’ll be open through Columbus Day this year. Hope to see you all out on the water. I should have added – Nice looking sails. And I like the Longshore insignia. Good photo.